Warwickshire completed their season in the premier division of the BDO Inter County Championships with a home tie against Glamorgan, both teams looking for a good result to move them up the league table, but the hosts didn’t have the best of starts as the ladies ‘B’ team finished on the wrong side of a 5-1 scoreline. Chloe McKivett was Warwickshire’s opener and gave them the ideal start when she beat Sue Powell 3-1 and took the match award for her 17.71 average, from there on in it was all Glamorgan as they romped to their 5-1 win. The men’s ‘B’ team were in top form chalking up their best win of the season 9-3 thanks to wins from Mark Strong, Ashley Hykin, Ian Shaw, Jack Wareing, Richard Foster, Dave Hill, Gareth Braham, James Hykin and Antony West. With an average of 27.9 in the opening game and a 4-2 win over Clayton Williams, Mark Strong took the match award. The women’s ‘A’ team rounded off their season with a fine 4-2 win Sue Gulliver (23.10) their lady of the match for a fifth consecutive game making it seven awards out of the nine games season. Other winners for the ‘A’ side were Kat Spanswick, Nina Bolt and Wendy Adams. The men’s ‘A’ team ended the season with six wins, one draw and just two defeats, one of those defeats being their 8-4 reversal against Glamorgan. With a 27.13 average Charlie Symons was the man of the match and making up the other wins were Dean Stewart, Noel Grant and Kevin Dowling. The overall 18-18 draw was enough to see Warwickshire finish fifth in the table equaling last season’s position but with eight points more as they amassed a total of 176 points compared to last season’s 168.. The Shirley Premier League have got their eleventh season underway with a total of 34 players contesting the title. The early pacesetter is newcomer John O’Sullivan who kicked off the season with two 4-0 wins over Michael Forsyth and Neil Comerford. With seven points, one fewer than O’Sullivan is second placed Mark Henderson who had a fine start to the new season with a 4-0 win over Derek Harper followed by a 3-1 success against Paul Harper, after the leading duo comes a trio of players Chris Thomas snr, Gary Cleverley and Phil Thomas all on six points. The new C’s Club Double Top League is up to week three and leading the field with six wins in as many games in which he has not dropped a single leg is Tom White. White’s perfect 18 points from his games gives him an average lead plus a game in hand on second placed Luis Barberan who is two points to the good on Neil Parsonage who is third with a game in hand on Barberan. It was a good week for both Steve Beale and Duane Green as they recorded their first wins of the campaign, Beale beating Ryan Beale 2-1 and by the same margin Green defeated Gary Shergold. 6-3 wins for both Highwood KB and Journeys End keeps both teams locked together on the same points and average at the top of Group One in the Forest of Arden Summer League. KB won their home tie against local rivals Highwood Arms while Journeys won away at Greville Arrows. Third in the table New Inns are on the same four points as the two teams above them trailing on average despite winning their latest fixture at Highwood Exiles 7-2. Dunky’s Boys lead the way in Group Two replacing The Crown in pole position after beating them 5-4, the two teams are level on average with Dunky’s now having a two points advantage. With just one more fixture to play in division one of the South Birmingham League Erdington Members Club, who have already won the title added a further 8-1 win over Coleshill Social to their account giving them a total undefeated points of 30. Second in the table Crown at Shard End were awarded two 9-0 wins over Punchbowl as their opponents failed to turn out and are now virtually assured of the runners up spot with 22 points six more than third and fourth placed Banbury Arrows and Coleshill Social. Iron Horse are champions of division two their latest 7-2 win over C’s Flights putting them on 24 points, a lead of nine over their nearest rivals C’s Arrows. The title for the Shirley and District Monday Night League is going to the wire with Highwood and Dunky’s Boys battling it out to the bitter end as they are both on the same 54 points with just one more fixture to play. A win would be good enough to give Highwood the title as they have a better average than Dunky’s, but defeat in the final game could well see them lose out to their chasing rivals. All of the top three teams were in great form in their penultimate fixture as leaders Highwood won 9-0 at Legionnaires, Dunky’s won by the same 9-0 at Plume of Feathers and third placed Red Lion made it a trio of whitewashes with their 9-0 win at Shirley Spartac. A 6-3 win at Townsend Social Club has taken Dudley Ex Serviceman’s Club’s points tally to 24 at the top of the Netherton Thursday Night League and keeps them just ahead of second placed Riddins Tavern on average together with a game in hand on their rivals. Riddins latest fixture saw them play at home and win 7-2 against bottom of the table The Crown whose defeat leaves them with just one win from their nine games played. There were big wins for the top four teams in the Stourbridge and District Monday Night League as leaders Brickmakers Arms won 9-0 at Kingswinford Conservative Club ‘B’ and the following three teams Ten Arches ‘A’, Ten Arches ‘B’ and Bird (Stourbridge) all had 7-2 wins over respective opponents Fox Inn (Lye), Hare and Hounds ‘B’ and Old Cat Inn (Wordsley). Brickmakers Arms and Ten Arches ‘A’ are both on 12 points, then comes a pack of four teams with ten points, Ten Arches ‘B’, Bird (Stourbridge), Britannia and Bridge (Kingswinford). Britannia move up one place to fifth after beating Hop House 6-3, Hop House dropping down two places to seventh while sixth in the table Bridge were 7-2 winners against The Swan. The George, after their 5-4 defeat by The Bell last week were quick to return to winning ways as they won 7-2 away to Roost to keep them top of the Rowley Monday Night League on average from The Bell who were also 7-2 winners in a home tie against Ex Serviceman’s ‘A’ who lost third place to Cradley Liberal Club who also won 7-2 at the Cottage to put them on 28 points just two short of the top two teams. The Cottage versus Liberal Club game saw Andy Powell (Cottage) and Jason Lowe (Cradley Liberal Club) both record an eight darts game. Steve Gillam hit a maximum for the George and for the Bell Trevor Brennan broke with 160 and A.Lynch checked out on 155. With three more games to play East Birmingham Allotment Holders Association have won the Small Heath League title, unbeaten in 21 games E.B.A.H.A’s latest fixture saw them win 8-1 at Sheldon Marlborough Arrows giving them an eight points advantage over second in the table Heartlands Club who went one better by handing out a 9-0 whitewash to their visiting team Cob’s Bar to guarantee them the runners up spot. It’s as you were at the top of the Hilltop Friendly Tuesday Night League with leaders Tipton Sport winning 5-2 away to third in the table Island Inn and second placed Dewdrop ‘A’ beating their local rivals Dewdrop ‘B’ 6-1 to retain the four points difference between the two teams. Island Inn’s defeat has left them two points behind Dewdrop ‘A’ and six off the top as are fourth placed Waggon and Horses who won 5-2 at Ivy Bush. With the top teams, Bulls Head (Netherton) and Dudley Ex Serviceman’s Club ‘A’ both winning 6-3 in the Brierley Hill Monday Night League the position remains the same with Bulls Head hanging on to pole position by just one leg of average. Both of the top two teams are on 28 points after Bulls Head won at Rose and Crown and the Ex Serviceman’s Club won away to Mount Pleasant, they have a four point’s buffer over third in the table Dudley Sports ‘A’ who won their home game with Pensnett Liberal Club 7-2. With just two remaining fixtures to play in the Sedgley and Gornal Tuesday night League Parkes Hall have one hand on the winner’s trophy as their latest 6-3 win over White Lion keeps them two points ahead of Old Bulls Head and they also have a superior average, Old Bulls Head had a close 5-4 home win over fifth placed Ashwood. Fellows Club recorded a rare win only their fourth in 28 games when they won 5-4 away to Five Ways who are some seven places above them and have 20 points more. 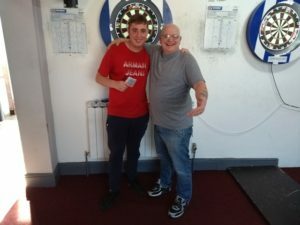 The Woodside Inn was the setting for the Brierley Hill Knockout and taking the top prize of £90 was Reece Colley who had a notable 6-3 win over West Midlands star Ian Jones in the final, Jones received £50. In the last four games Colley won 5-3 against Steve Gillam while Jones had a more comfortable 5-1 success against Jamie Rollinson. Both losing semi-finalists picked up £20. It was knockout week in the Pip Club League and taking the honours in the Division One Singles Knockout was Mark Martin (Queens Head) who beat Ian Turner (The Office) in the final. Losing semi-finalists were Martin ‘Eddie’ Edwards and Wayne Hewins who both represented The Office. The Division Two Challenge Cup final produced a win for Red Lion with Old Liberal House runners up. Brickmakers Arms have opened up a four points lead at the top of the Cradley Tuesday Night League after beating Wheatsheaf 6-3. As a result of their defeat Wheatsheaf surrender their second place to Netherton Cricket Club ‘A’ whose 7-2 win at Riddins Tavern has given them 16 points, four short of Brickmakers but two ahead of Wheatsheaf, Hawne Lane Tavern and Bulls Head (Netherton), Hawne Lane won 6-3 away to Chop House while Bulls Head went down by the same margin at Roost. At the halfway mark of the Yeltz Bar Tuesday Night Singles League Matt Moore with 91 points has a lead of eight points over second placed Jordan Ward in League One the latest fixtures seeing both players win 5-0 Moore against Will Watson and Ward against Ian Mills. In League Two Rob Smith leads the way with 92 points, he also won 5-0 against Richard Reed. James Hykin is in second place with 87 points after yet another straight 5-0 win, his opponent being Dan Singleton. Richard Hill with 88 points tops League Three he was the third league leader to win 5-0 as he accounted for Alex Adams to put him four points ahead of second placed Loz Slater who has a game in hand. Three teams are on 10 points at the top of division one of the Sutton and District Summer League, The Boat continue to head the table on average after they won 7-2 at Oscott Social, Erdington Club, who also won 7-2 against The Fox are second and Golden Hind take over third place from Erdington Arrows after beating them 5-4, however Arrows have played one game more than the two teams above them. Pint Pot Flights have been ousted from the number one spot in division two after losing 5-4 away to fifth placed Old Oscott Arrows, taking over at the top of the table is Boldmere Tap who had an 8-1 win against St Thomas Arrows. Boldmere have played seven games and have 12 points two more than Pint Pot Flights, The Boot and Old Oscott Arrows who have all played six games. Swan Compton were the only losers in the top five teams in the Tettenhall Wednesday Night League going down 6-1 away to top of the table Whitmore Reans WMC. Whitmore with 16 points are top on average from ECC ‘A’ and Bull, ECC ‘A’ winning 5-2 against Emerald and Bull beating bottom team Pilot 4-3. Bull have only played nine games as have fourth placed Hurst Hill and so both have a game in hand on the top two teams. Hurst Hill are on 14 points after their 6-1 success against McGhees leaving them two points less than the three teams above them.